This old postcard was made in the United States and published in Cuba by "C. Jordi" of Havana. 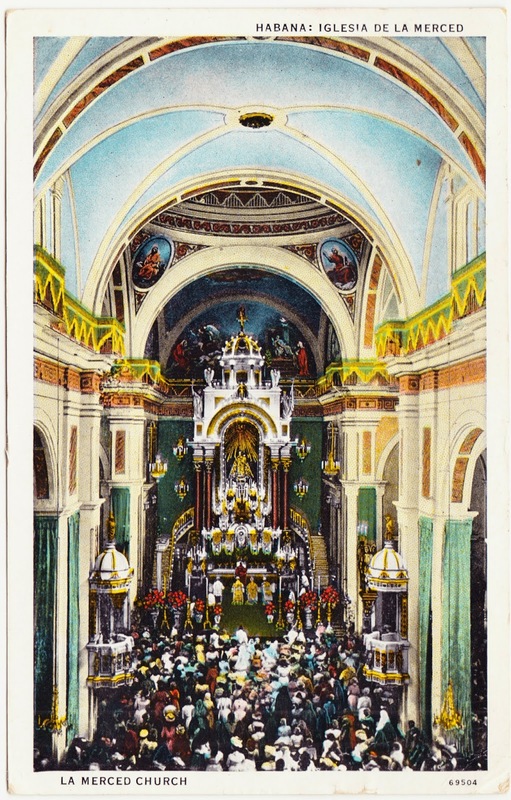 The pre-printed caption on the back states: "This shows a Catholic church during the celebration of mass. Many of Havana's churches are interesting to the tourist because of their magnificent interiors replete with beautiful altars, images of saints, paintings, etc." "Built between 1865 and 1867, this is arguably one of Havana's most lush churches. The temple stands opposite a small square and its façade, constructed in Baroque style, features the principal door with its round arch and central niche. The niche, presbytery, cupola and naves were decorated in 1904 by prestigious Cuban artists. The Lourdes Chapel, inaugurated in 1876 and decorated with beautiful mural paintings by prestigious Cuban artists, is the most outstanding pictorial collection within Cuban religious colonial architecture. Its lavish robin-eggshell blue interior has high arches and frescoes covering the chapel and cupola. The Capilla de Lourdes (Lourdes Chapel) has an outstanding collection of religious paintings by renowned Cuban artists: Esteban Chartrand, Miguel Melero, Pidier Petit and Juan Crosa, among others." Just to remind you — this is one of the churches you saw or — didn't you? They're all asking for you down here. This postcard was made in Germany and the "importer and jobber" was S.A. Longenecker of Rapid City, South Dakota. 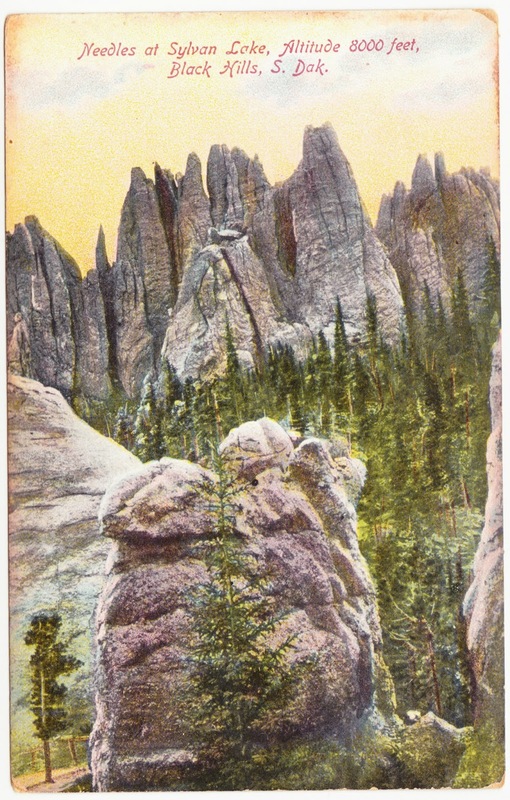 The Needles are a gorgeous area of granite pillars and spires within Custer State Park. Meanwhile, Sylvan Lake was man-made in 1881, in conjunction with an adjacent dam of the same name. Perhaps the most interesting historical tidbit about this area is that the Needles were the first site proposed for the creation of the Mount Rushmore carvings. But sculptor Gutzon Borglum rejected the location, in part because of how thin the Needles were. You'd barely get Washington's nose on some of those. "Hello Stella. If you see any of the folks show them these cards for they would apreciate [sic] them very mutch [sic] and tell them I said they were to write once in a while. From your friend Aberdeen [?]" Book cover: "Cloe Spin and her Happy Family"